Ribogenomics has three major components: transcriptomes (all protein-coding transcripts), modomes (nucleobase modifications and their positions in all transcripts), and editomes (all edited transcripts). Over the past four decades, we have learnt a great deal about RNA biology, especially on transcriptomes. First, all transcriptomes are cell-specific although about half of the transcripts of a given transcriptome are shared among all cells, which are known as house-keeping (HK) genes. Less than 7% of the HK genes are expressed at a relatively constant level across cell types. Second, most of the human genes are conditionally and alternatively transcribed, maximizing their protein-coding potential. Third, transcription level regulation is complex and intense to the extent that there has not been a single cell created equal to the next at the transcription level. Fourth, there are ample non-protein-coding transcripts in various size ranges in a cell, playing complex operational roles at multiple cellular activity levels. Fifth, RNA nucleobase modifications also play regulatory roles, which govern interactions between operational RNAs and cellular protein machineries. Therefore, a large-scale project to understand human transcriptomes is of essence for precision medicine. It is unfortunate that we still wait for a direct RNA sequencing device that reads both nucleotides and nucleobase modifications, ready for the Human Ribogenome Project. Dr. Jun Yu obtained his B.S. degree of biochemistry from Jilin University in 1983. 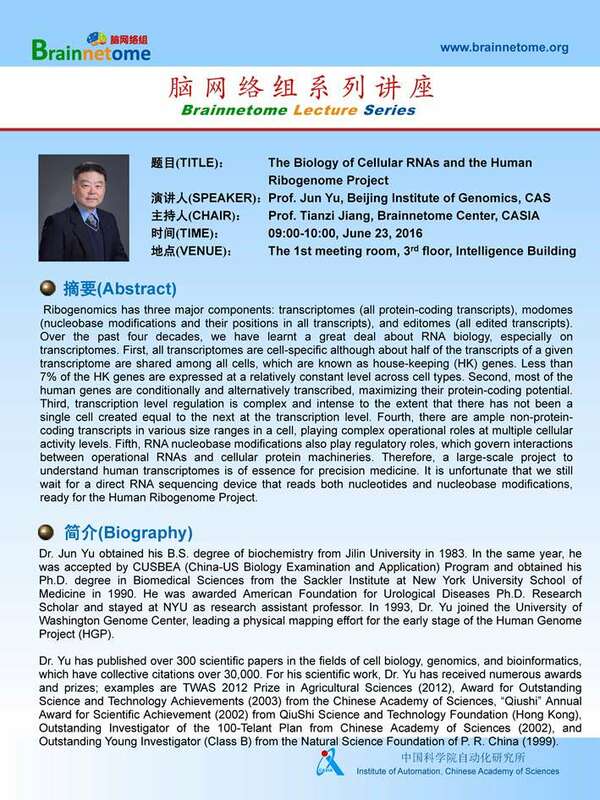 In the same year, he was accepted by CUSBEA (China-US Biology Examination and Application) Program and obtained his Ph.D. degree in Biomedical Sciences from the Sackler Institute at New York University School of Medicine in 1990. He was awarded American Foundation for Urological Diseases Ph.D. Research Scholar and stayed at NYU as research assistant professor. In 1993, Dr. Yu joined the University of Washington Genome Center, leading a physical mapping effort for the early stage of the Human Genome Project (HGP). Dr. Yu has published over 300 scientific papers in the fields of cell biology, genomics, and bioinformatics, which have collective citations over 30,000. For his scientific work, Dr. Yu has received numerous awards and prizes; examples are TWAS 2012 Prize in Agricultural Sciences (2012), Award for Outstanding Science and Technology Achievements (2003) from the Chinese Academy of Sciences, "Qiushi" Annual Award for Scientific Achievement (2002) from QiuShi Science and Technology Foundation (Hong Kong), Outstanding Investigator of the 100-Telant Plan from Chinese Academy of Sciences (2002), and Outstanding Young Investigator (Class B) from the Natural Science Foundation of P. R. China (1999).